Whenever I am given an opportunity to tryout something new (fitness wise) I always jump at the chance. When Augusta Active reached out I was super excited for two main reasons: 1. Their clothes are very cute and simple 2. Their clothes are so reasonably priced! As I shared with you all before I am cheap so when I can find fitness clothes for less without trading quality it’s pretty much a match made in heaven. 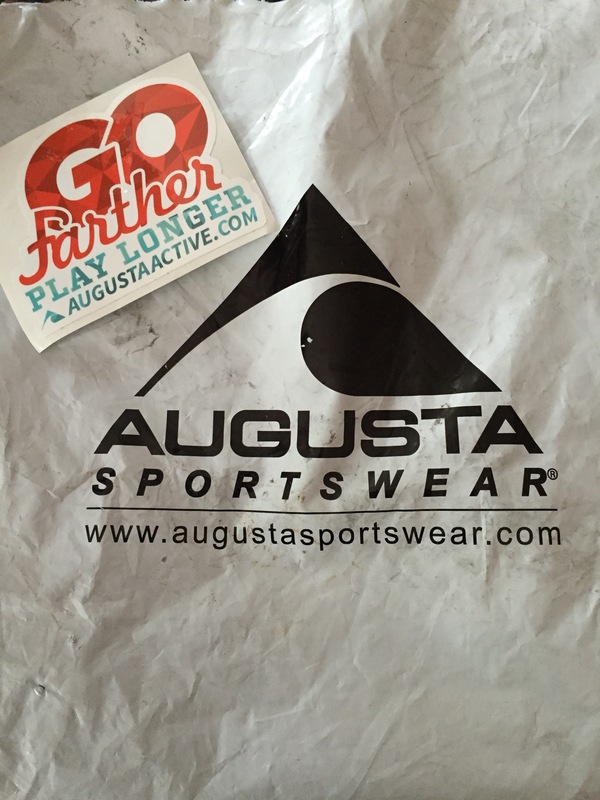 When I got home from a long week of school I was delighted to find a package of Augusta Active clothing that I had picked out to try in exchange for social shares and a blog review. That being said the opinions in this post are mine and honest! The first item I tried out was the ladies sensation tee! This shirt is super comfy and how can you not love the back cut-out detail! I paired the top with jeans but I wouldn’t hesitate to wear this with some workout capris and wear to a yoga or barre fitness class! This top will now be a staple in my wardrobe- both casual and when breaking a sweat! Saturday led me to a local 5k. I knew the weather was going to be in the 60’s so I grabbed my royal blue racerback tank and paired with my new balance capris. The top was super comfortable and did not ride up or move at all throughout the race! I love all the color options available in this cut and will be adding a few more to my stash soon! Next up is the ladies sprint shorts. I put these on and headed out for a quick run with the kids. The color is awesome and they are comfortable! These shorts are a very soft mesh outside with an inside liner. They also have a draw string which is nice incase they are a little loose! The best part is that these shorts will match my Zooma singlet perfectly! This is my potential half marathon outfit for St. Michaels this weekend (weather depending)! Excited to test these shorts out for the “long run”! I was also sent women’s Sadie shorts pictured below. These are also very soft and like the sprint shorts, feature the very soft mesh on the outside but these have spandex underneath. I love the pop of color on the waist band and the spandex shorts underneath. They are a bit shorter but other than that I am ready to take them for a test ride if this weather would ever cooperate! The last item I was sent was the Women’s Sadie Tank. Just like the shorts this tank has a pop of color and a built in bra. This is a very loose fitting tank and would be good for those days that you do not want the tight feel of most work out shirts or tanks. The best part is that this tank can also be transitioned from the gym to your next event. I put on some black leggings and paired it with my super comfy grey sweater and we were out the door for dinner! Overall I am very happy with the Augusta Active items I was sent to sample. I could not get over the comfort and simplicity of each item I was sent. On top of the clothes being awesome you really cannot beat their prices. Be sure to head on over and check out all the cool items they have. I have noticed that more often than not they have some sort of promotion going on. Be sure to also check out the #augustaactive hashtag on social media to see others sporting this brand! What Augusta Active item did you like the best? I have like Augusta for a whIle. My football team has used them for our uniforms for the past few years. The light weight sweat- wisking material is great! Ooh those shorts and our singlet….nice!! It is a pretty good match with the Zooma Singlet. The colors on the back look good with the shorts! I’m always hesitant about open back tops as I don’t know how to prevent my bra strap from showing. I do like the Sadie tank.